Cookie recipe contest - finalist #1 - A Life From Scratch. 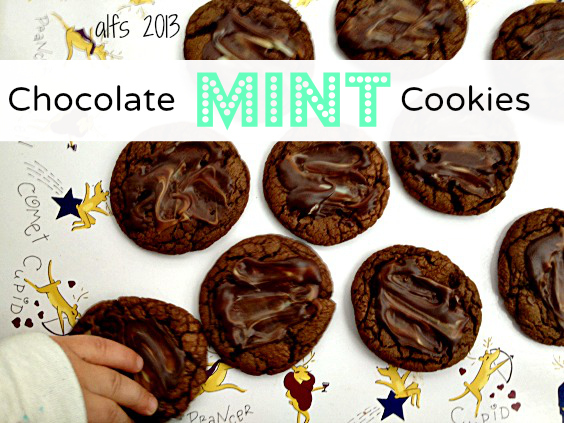 Our first finalist of our cookie contest is Lindsey L, who submitted chocolate mint cookies! 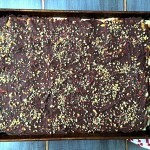 Thank you so much for submitting your recipe to ALFS. A huge part of this contest was to get some new ideas going and this recipe is so different from anything my family has made before. 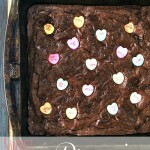 We couldn’t wait to start baking! L was of course totally into the shiny green Andes mints. The bargaining began – ‘mom, after dinner can I have two of the mints?’ Sure L but the cookies will be coming out of the oven a little later and the mints go on top of the warm cookies. ‘Hmmm, ok but I really want a treat right after dinner. How about I have one mint then and then wait and eat one mint on top of the cookies later?’ Deal. We got to mixing, and chilling, and baking, and watching the mints sloooooowly melt over the deep chocolate cookies that baked to absolute perfection. Finally they were cooled and it was taste testing time. I explained it to L. The scale of 1-10. 10 being the best thing that you’ve ever eaten and 1 being the worst. 5 was decent, 8 was good but not great and 2 was almost near spitting out. We established a base line and I handed him the cookie. One bite in – ‘mom, it’s a 10. No wait it’s a 20! This one is going to win this one is going to win!’ And B? Well, that would be his little chubby hand in the picture. He couldn’t stay away. In a large saucepan, melt butter. Add sugar & water and stir until dissolved- careful not to burn. Add chocolate chips, remove from heat, stir until melted. Pour in a large bowl and let stand for 10 minutes. Beat eggs in one at a time. Add dry ingredients a little at a time, mix well. Chill one hour. Roll into 1" balls and place on foil lined or parchment paper-lined cookie sheet. Bake at 350 degrees for 12-13 minutes. Do not overbake! They may not look done- you want the middle to be a little chewy. After removing from oven, put an Andes Mint on top of each cookie. Let stand for 5-10 minutes, then swirl it with a spoon. Let stand to harden. Oooooh I have everything to make these except for the mints. Picking those up tonight! These sound delicious and easy enough that even a non baker like me should be able to do them. Next bake sale? I’m in! I love B’s hand in the picture – so cute!! Yum! Biz recently posted…Ugly Sweater and Snowmen!